While we aren't RV'ers by any stretch of the imagination, Thousand Trails, home to some of the most beautiful and natural campgrounds and RV resorts across the U.S., is giving outdoor enthusiasts a chance to get out and camp with the Gear Up and Camp sweepstakes. One lucky camper will win a free week of camping and a camping gear package, with a combined value of $1100. Sweepstakes entrants will also be entered for a chance to win one of four second place prize packages, and one of 30 third place prize packages daily. 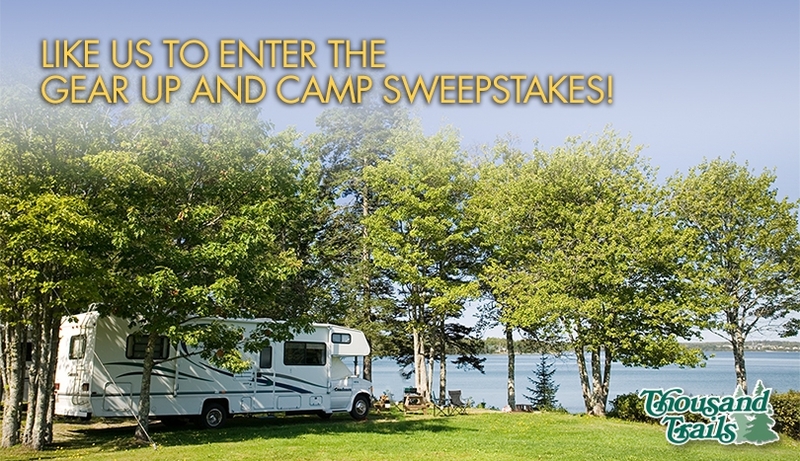 The sweepstakes grand prize includes a week-long camping trip for the winner at any participating Thousand Trails or Encore RV resort campground. In addition, the winner will receive a package of camping gear, including the following: Rand McNally’s RV-specific GPS device - the RVND™ 7720 LM; $100 gas card; Strongback Chair; Coghlan's Camper's S'mores Grill and Corn Popper; Coleman Lantern; $50 MyRVMarket.com gift certificate; Thousand Trails sweatshirt, umbrella, window cling, backpack, blanket and travel mug; and a Duck Harbor Cool Weather Sleeping bag. Four additional winners will be selected each week of the promotion to receive a second prize package that includes a week-long camping trip at any participating Thousand Trails or Encore RV resort campground and a package including a Thousand Trails backpack, blanket, travel mug, and window cling. Thirty winners will be selected at the end of each day of the promotion to receive a Thousand Trails camping pack, which includes a backpack, blanket, travel mug and window cling. All in all, 35 prizes will be awarded throughout the course of the Thousand Trails Gear Up and Camp sweepstakes. To enter, visit the Thousand Trails Facebook page at www.facebook.com/ThousandTrails. Entrants are also encouraged to invite their Facebook friends to enter for additional entries. All official terms and conditions can be found on the Thousand Trails Facebook page. The contest will run through April 30, 2013. Encore and Thousand Trails feature 173 RV resorts across North America. Owned and operated by Equity LifeStyle Properties, Inc. (NYSE: ELS), Encore, Thousand Trails, and its affiliates offer RV and outdoor recreation enthusiasts opportunities to enjoy the outdoors in top vacation destinations, complemented with resort-style amenities. Good luck to all who enter. Be a Summit Sampler, Get $500!! !